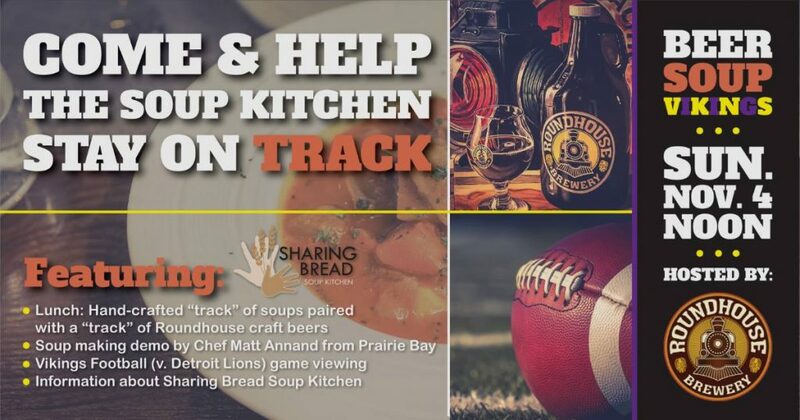 Join Matt Annand, Prairie Bay and Roundhouse Brewery to help the Sharing Bread Soup Kitchen “Stay on Track”! The Vikings game will be on and we will be offering a soup track and a flight track for $12 for the pair, or $7 individually. Also, check out Chef Matts soup-making demonstration. The proceeds from the track sales and all cash tips will go to support Sharing Bread. Bring the family and enjoy a Sunday afternoon, craft soups, craft beers all for a good cause!